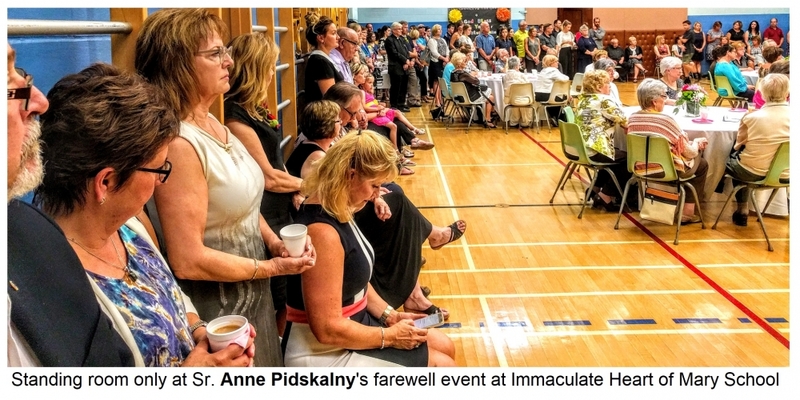 Immaculate Heart of Mary School hosted a farewell event for Sr. Anne Pidskalny, SSMI as she retired after 37 years of dedicated service at the school by teaching, administrating, mentoring and leading in many, many ways. It was an afternoon ‘come-and-go’ event scheduled to take place at the School on Sunday, September 10 from 2:00 to 5:00 PM. The thing was, that a lot of people came, but they didn’t go. They stood in line to personally greet Sr. Anne, then they stayed for a very touching program and then they came back in to mingle and reminisce some more. Sr. Anne had just marked her 50 years of life in the Ukrainian congregation of the Sisters Servants of Mary Immaculate the day before in a private in-community celebration. Many remarked at the farewell event that by her youthful appearance and young spirit, one would hardly believe that she was a Sister for 50 years already or that she had served as a teacher for most of those years. Sister Anne may be riding off into the sunset of her many years at Immaculate Heart, but as her sister said, after a relatively brief three-month sabbatical, she will then begin writing the next chapter of her life as one dedicated to the Lord and His People. Sister Anne’s sister, Genevieve Morris, spoke a truly heartwarming greeting on behalf of the family. The authentic love, respect and pride that came through her words were themselves a testimony to family life and a family’s support of a religious vocation that rose up from among them. Although Sr. Anne’s was not the only religious vocation from her immediate family – her brothers Fr. Joseph Pidskalny, OSBM and Fr. Peter Pidskalny, CSsR. are well known in parishes across Canada. A farewell program began at 3:30 PM with School Principal Mr. Rod Picklyk, serving as the master of ceremonies. A number of individuals, most speaking on behalf of various groups, came to the microphone to express their love and gratitude to Sr. Anne. Aside from Sister’s ridna sestra, mentioned above, there were representatives of the teachers and the parents that had the pleasure of working with Sister Anne over the years. The program began with some reflections and a prayer by Sr. Janice Saluk who herself will be leaving Winnipeg this month to take up her duties as a recently elected member of her congregation’s General Council in Rome. Monsignor Michael Buyachok, was called forward to greet and thank Sister Anne on behalf of the clergy that serves the Archeparchy of Winnipeg. He is the rector of Sts. Volodymyr and Olha Cathedral where the school holds monthly Divine Liturgies and special major events. He brought greetings on behalf of the Archbishop of Winnipeg, Metropolitan Lawrence Huculak, who was away attending the Synod of Bishops in Ukraine at the time, and on behalf of all the clergy presently serving Manitoba. However, Monsignor Buyachok also wanted to call to mind the many “Patriarchs, Metropolitans, Bishops, Priests and Deacons” that Sister met and collaborated with in her work over the years. Most of the clergy that were listed are no longer with us, but they too appreciated everything that Sr. Anne did for the children and for the School. The Provincial Superior of the Sisters Servants of Mary Immaculate in Canada, Sr. Christina Syrotynska from Toronto expressed thanks and congratulations on behalf of the Sisters, but she also shared Sr. Anne’s fascinating vocation story. She compared Sr. Anne to Canadian literary icon, “Anne of Green Gables” in that she too was vivacious and yet humble. She said, however, that the honouree of the day was uniquely an “Anne of the Prairies”. Sr. Anne left home at the age of 17 to travel across Canada by train to Toronto and then be driven to Ancaster, Ontario where the Sisters then had their postulancy and novitiate program. Within six months she took upon herself the religious habit of a Sister and willingly made the vows of obedience, chastity and poverty to dedicate her life without reserve to serving the Lord and His People. After completing her teachers training, she taught in Toronto, Oshawa, Hamilton, then eventually in Winnipeg where she would serve the next 37 years at Immaculate Heart of Mary School. 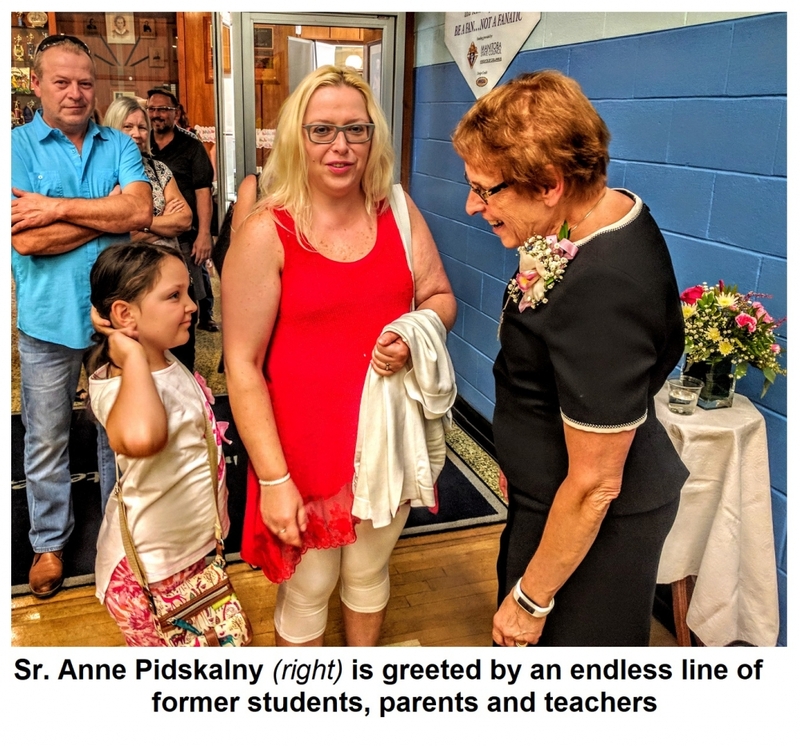 Among the presentations and greetings, those by students and former students in particular warmed the hearts of the hundreds of parents, teachers and students that came out to be there with their dear Sr. Anne. 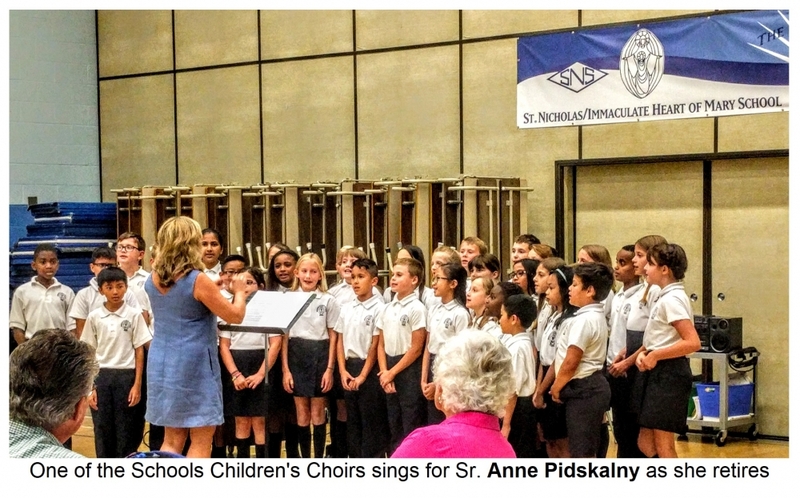 The grades 4-6 children’s choir of the school, under the direction of Mrs. Oksana Stanowych sang a moving song of appreciation that concluded with the words, “Teacher, I’ll never be the same”. The co-chairs of the IHMS Alumni Association, Mikhas’ and Johanna Chabluk shared some fond and funny memories from their time with Sr. Anne as students. After the formal program in the school auditorium, all were invited outside to witness the dedication of the new elaborate playground and schoolyard make-over that was completed by an estimated cost of some 200 thousand dollars. Before Fr. Mark Gnutel blessed the new facility, the chair of the School’s Board of Trustees, Mr. Jason Brennon, made a surprising announcement that delighted everyone. 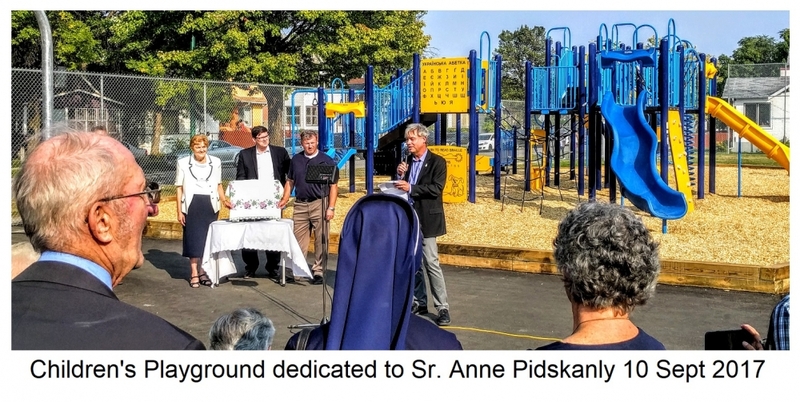 He announced that the new playground would be dedicated in honour of Sr. Anne. A plaque was unveiled with an image of Sr. Anne and words of dedication. It will be erected near the playground site. In the course of the afternoon, we learned that Sr. Ruth Aney, SSMI will be assisting at the school after Sr. Anne Leaves. Those that know Sr. Ruth’s schedule as she helps out at other parishes - in their choirs and catechism programs, etc. - wonder how she will manage, but…. She too is of the same spirit as Sr. Anne and she too will find a way to be "all things to all people"…. (1 Corinthians 9:19-23).